ATVConnection.com ATV Enthusiast Community > Brand Discussions Area > Polaris > Polaris Ask an Expert! In fond memory of Old Polaris Tech. Polaris Ask an Expert! In fond memory of Old Polaris Tech. An area where experts in their field will answer non-general questions about your Polaris ATV. "old polaris tech" and other experts will answer your questions as they have time. ASK ALL GENERAL QUESTIONS OR BASIC QUESTIONS IN THE POLARIS FORUM. Basic or General questions posted in a expert section will be moved! Ive never used a parts washer to clean a carb, not sure it will clean it well enough. Verify with aerosol carb cleaner, and compressed air that all the passages are clear(even the passages in the back of the carb) Make sure the diaphragm isnt torn or will turn on the slide. The fittings on the back of the carb are actually vents. They are usually connected with the "Y" so no problem there. The one on the front is probably because its an aftermarket and not needed on this unit. Just plug it off. Try spraying carb cleaner around the boots, carb etc and see if the motor changes rpm indicating an air leak. Question - The air box lid in installed and it still runs bad? These units dont run correctly with the air box lid off. I use the parts washer because it’s heated and has been decent at cleaning things in the past and the cleaning agent in it is very mild, but I also spray the ports with compressed air. I just don’t know where I am supposed to be seeing air blow through for each of the ports. I just took it out to clean again to see if I missed anything and took the jets out and all seems clear. I have not tried spraying carb cleaner around the boots yet again but I suspect that there should be no leaks as both boots are new, and by the amount I have to cover up the intake for it to run decent there would have to be like a half inch hole in one of the boots to be sucking in that much air to mess it up. I am running with the air box lid on, I am actually having to block like 3/4 of the mini snorkel coming off of it just to restrict airflow enough to have a mixture capable of revving it up and such. I just cleaned the carb again, maybe I missed something the first time when I did it, but I’m kinda doubtful. My idea of parts washer was a solvent tank, yours sounds good. I use a heated ultrasonic myself. 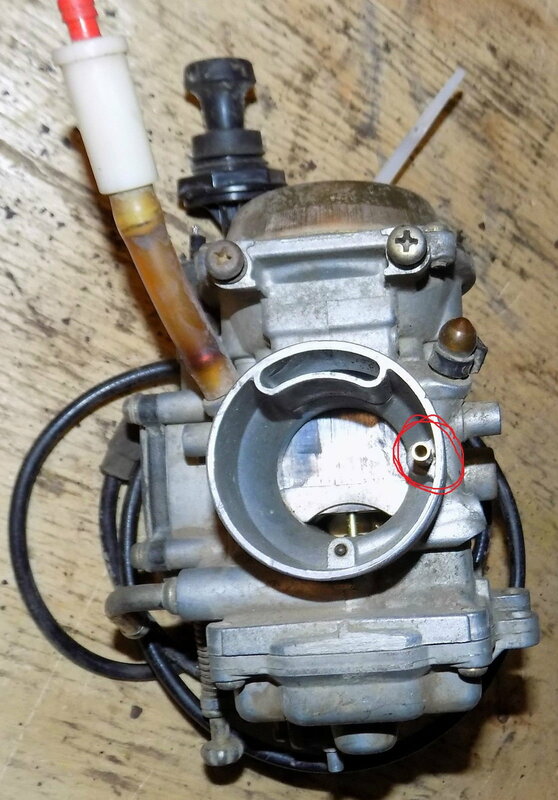 Its hard to explain where air pressure should exit from but if theres a hole, usually they go somewhere so see if you can hear air coming from another spot on the carb, when blowing air out. Rubber tipped air gun works well for this. After approx 1/4 throttle, the main jet, jet needle, needle jet and slide comes into play in the carb. Id focus on that portion of the carb. Tried to view the video but all I saw was some lady and a bunch of cash. Will check later and see if something changes. Got the vid to work on my pc. Robbing more pics from the net. I know you have cleaned the carb and probably very well. I'm not arguing that point. Did you verify the passage circled in red is clear? I have seen people clean the carbs very well and focused on the internals in the bowl, and overlook the air passages in the rear of the carb. There are a lot of carbs out there and some have pipes that go places, others have pipes that dont go anywhere. With out your carb in my hand I cant guarantee yours goes anywhere. If it does however have a hole in it, they can get plugged up, causing no air to enter the emulsion tube and not pull fuel correctly. Could cause issues. If its clear I'd stick a bigger main jet in it and see how it runs.